Morning fog rising above Lake Matheson and Mount Cook and Mount Tasman reflect in the lake near Fox Glacier, Westland, Tai Poutini National Park, South Island, New Zealand. Lake Matheson is an ideal location for the scenic picture postcard. It's a small lake surrounded by trees. That means it is almost always has still, flat water surface - exactly what you need for reflections. It also has a view out over the tallest section of the New Zealand's Southern Alps - with Mt Cook (Aoraki) and Mt. Tasman. So it's the perfect spot for a nice picture of the distant snow-capped mountains with reflection in the still water. This image belongs to the travel and nature stock photo library. This stock photo of Dawn at Lake Matheson is available for licensing for commercial and editorial uses including websites, blogs, books, magazines, brochures and advertising. Restrictions may apply for images which contain third party copyrighted material or sensitive subjects. Photos of artwork are for editorial use only. 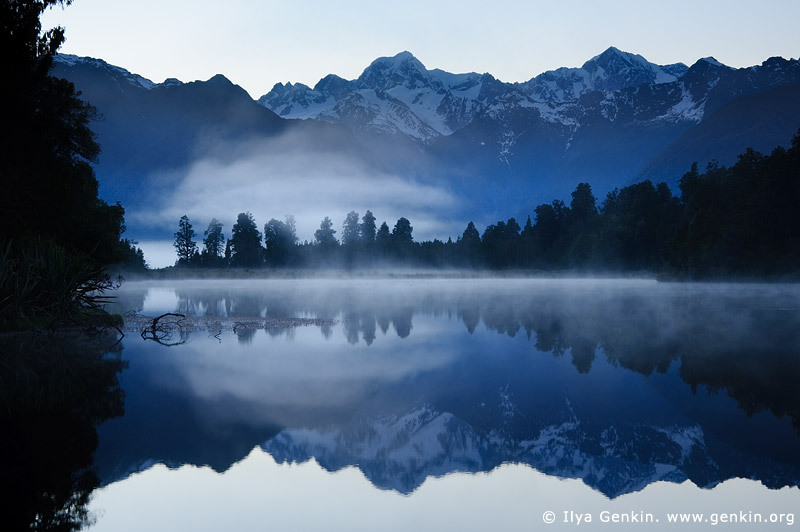 This image id NZ-LAKE-MATHESON-0003 of Dawn at Lake Matheson, is copyrighted © by Ilya Genkin. This is not a public domain image.